Thank you for considering creating a translation for Andama Remote Deskop. Bellow is a guide that describes in detail how this can be done. Download and install Qt from this link: https://www.qt.io/download/. Choose the open source edition. Qt includes the software that we will use to create the translation. Also you can compile and run Andama if you would like to test the translation on your own. 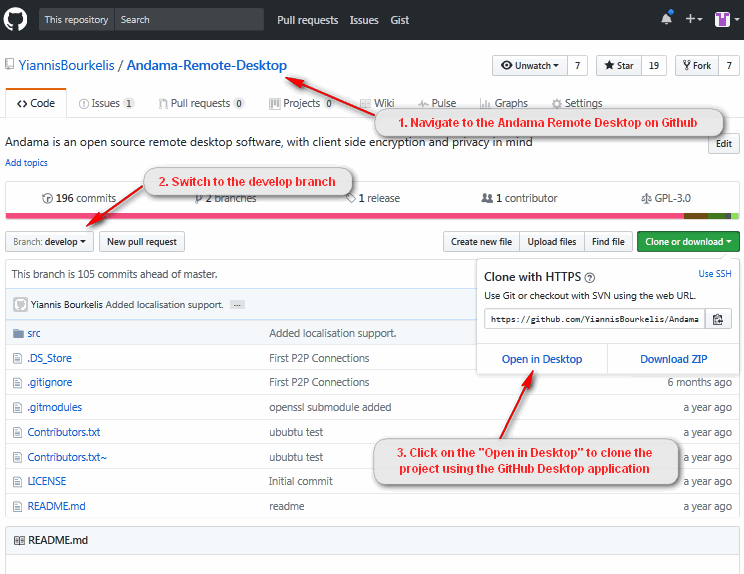 Clone the Andama github repository. If you have Windows/Mac you can download GitHub Desktop from this link: https://desktop.github.com. On Linux you can clone the Andama repository using the terminal. Type git clone -b develop https://github.com/YiannisBourkelis/Andama-Remote-Desktop.git to clone the repository. To translate Andama you should use the Qt Linguist. On your Mac it is located inside the folder you installed Qt, at the path <your user folder>/Qt/5.7/clang_64/bin/Linguist.app. Similary you can locate the Linguist application on your Windows or Linux machine. The language file is located where you cloned the Andama repository. For example the Greek language file is located at <andama cloned directory>/Andama-Remote-Desktop/src/Andama/Andama_el.ts. Once you open the language file in Qt Linguist you can start the translation. A video that describes the translation process is available here: https://youtu.be/nbNdv4tWWfw?t=7m40s. You should only tranlsate the language file from English to the target language. Everything else presented in the video is not required for you. After completing the translation, send me a pull request using the Github Desktop https://help.github.com/desktop/guides/contributing/sending-a-pull-request/, or using your terminal. Alternative you can upload the language file at the related forum thread you created for the language translation https://github.com/YiannisBourkelis/Andama-Remote-Desktop/issues.